These April Fools Day Biscotti might be the ultimate in discomforting practical jokes. A practical joke, also known as a prank, gag, jape or shenanigan, is a mischievous trick or joke played on someone, typically causing the victim to experience embarrassment, perplexity, confusion, or discomfort. And what day is known for Practical Jokes? Why of course April Fools Day! April Fool's Day, sometimes called All Fools' Day is celebrated on day 1 of April every year. The 1st of April is not a national holiday, but is widely recognized and celebrated in various countries as a day when people play practical jokes and hoaxes on each other. Switching salt for sugar in the sugar bowl, might be funny, but if you want an ultimate practical joke to play then make these Biscotti with sun-dried tomatoes and Habanero peppers. The habanero is pronounced: hah bahn air oh or, ah bahn air oh, without the leading 'h' sound. You'll hear it said both ways. The habanero is the hottest chile pepper you'll find in your local grocery stores, and they are very, very hot. The oil in the habanero, as well as many other hot chilies, can be very painful if you get it in your eyes or on open wounds on your hands. Unripe habaneros are green, but the color at maturity varies. Common colors are orange and red, but white, brown, and pink are also seen. At 200,000 to 300,000 Scoville heat units the habanero called Red Savina used to be thought of as the hottest pepper, but it seems that now the Bhut Jolokia (or ghost pepper) holds the Guinness World Record as the world's hottest spice, recording over 1,000,000 Scoville units -- that's 3 to 4 times hotter than the hottest habanero! So if you are feeling particularly evil change out the habaneros for ghost peppers, although they are somewhat harder to find. 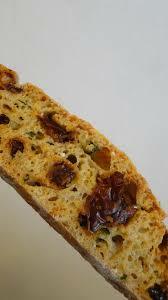 If you plan to make these April Fools Day Biscotti,I highly recommend wearing gloves while handling the peppers. This recipe was intended to be a joke, but who knows maybe you know someone who would enjoy it, after all we have different tolerance for heat in foods. And some love it hot, some love it hotter and some love it the hottest. Just make sure there is plenty of cold beer on hand. 1/4 cup sliced or diced red Habanero Peppers. Place one of your oven racks in the center of your oven and preheat the oven to 350 degrees. In a medium mixing bowl, whisk together the flour, herbs, baking powder, salt, chopped sun dried tomatoes and habaneros then set aside. In another bowl beat the butter until smooth using the paddle attachment on a stand mixer or a hand mixer. Add the sugar and eggs mix until well blended. Slowly add the flour mixture and beat until combined. Move the dough to the baking sheet, dampen your hands and then form the dough into a 13 x 3.5 log. Place into oven and bake 30 minutes or until golden brown. Cool for 30 minutes. Transfer the log to a cutting board. Using a serrated knife, cut on diagonal into 1/2-inch thick slices. Return to baking sheet, standing on bottom. Bake an additional 15 minutes or until light golden brown. Cool completely before serving or storing in an airtight container.